1.) What was the birthplace of Abraham Lincoln? 2.) What was the age of Abraham Lincoln, when his mother died? 3.) What was the name of Abraham Lincoln stepmother? 4.) When Abraham Lincoln elected as the President of the United States? 5.) Who was the 15th Fifteenth President of the United States? 6.) Abraham Lincoln was the ..th President of United States? 7.) What was the name of Abraham Lincoln wife? 8.) Abraham Lincoln served as a volunteer in the Illinois Militia from April 21, 1832-July 10, 1832 during the -------- War. 9.) 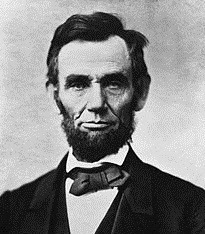 Abraham Lincoln worked as a ------, store clerk, surveyor, militia soldier and a lawyer. 10.) Name the American stage actor who assassinated President Abraham Lincoln at Ford's Theater, in Washington, D.C., on April 14, 1865. 11.) When Abraham Lincoln died?